The Pine Bush is located in the Capital District, between Albany and Schenectady. The boundaries are Fuller Road on the east, Route 5 (Central Avenue) on the North, Route 146 on the west, and Route 20 (Western Avenue) on the South. The Pine Bush is located in three municipalities-Albany, Guilderland and Colonie. The Pine Bush originally encompassed 58,000 acres extending from downtown Albany to Rotterdam. Now, there are only 5,800 acres remaining. Black Line: The Pine Bush Commission's study area. Purple Line: Rough estimate of the former extent of the Pine Bush based on the distribution of sand and sand dunes in a contiguous area. Gray Dashed Line: Continguous Pine Bush as late as 1945. 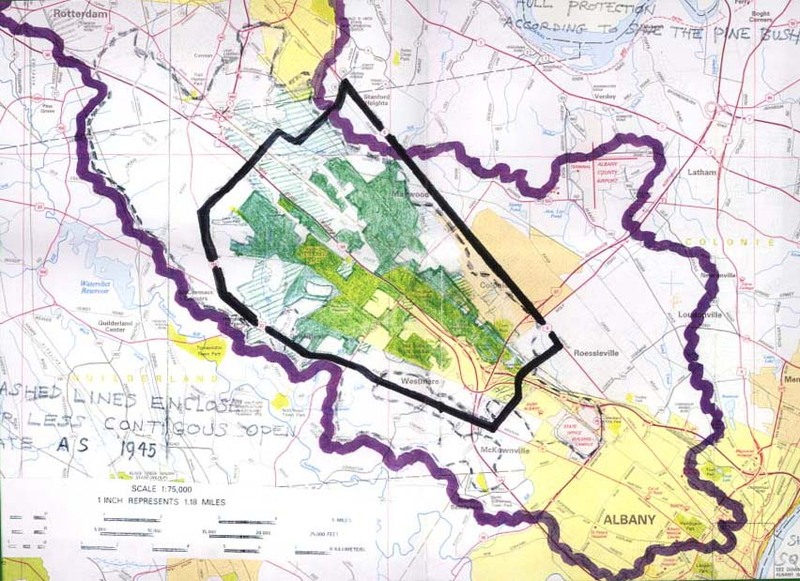 Solid Green Area: Preserved or ear-marked for full-protection by the Pine Bush Commission as of 1995. Some of the full-protection areas have been or are being developed. Striped Green Area: Contiguous open space that should be given full protection according to Save the Pine Bush. The markings on this map were drawn by John Wolcott, based on research conducted by John Wolcott and Jerry Mueller. Drawn March, 1995.